CASSAR. On March 22, at Mater Dei Hospital, DORIS of Sliema, widow of Saviour, aged 87, passed away peacefully comforted by the rites of Holy Church. She leaves to mourn her loss her children Frank and his wife Monica, Marlene Cassar and Twanny Spiteri, her grandchildren Andrè, Ruben, Diana, Amanda and John, their respective spouses, her beloved great-grandchildren, her in-laws, nephews and nieces, relatives and friends. The funeral cortège leaves Mater Dei Hospital today, Saturday, March 23, at 1.30pm, for Sacro Cuor parish church, Sliema, where Mass præsente cadavere will be said at 2pm, followed by interment at Santa Maria Addolorata Cemetery. Lord, grant her eternal rest. GRECH. On March 21, at Villa Messina, Rabat, VICTOR of Sliema, aged 88, passed away peacefully. He leaves to mourn his loss his wife Helen, his children Maria, and John and his wife Elaine, his grandchildren Pia and Mattea, his brother Michael and his family, in-laws, other relatives and friends. 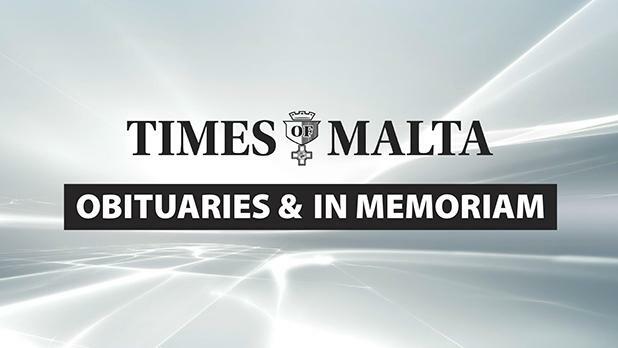 The funeral Mass will be said today, Saturday, March 23, at 2pm, at Stella Maris parish church, Sliema, followed by interment at Santa Maria Addo-lorata Cemetery. No flowers by request but donations to Id-Dar tal-Providenza, Siġġiewi, will be greatly appreciated. Lord, grant him eternal rest. CALLEJA. In loving memory of ANTHONY, a dear husband and father, on the 11th anniversary of his meeting with the Risen Christ. Sadly missed and lovingly remembered by his wife Jacqueline, his children Theresa and her husband Roderick, Veronica, Maria and her husband Duncan, and Joseph. Lord, grant him eternal rest. CARUANA – Lt. Col. GUSTAV CARUANA, MBE, ED (KOMR). Unfading and treasured memories of a dearly beloved father and grandfather who went to meet the Risen Lord 14 years ago. He lives forever in the hearts of his daughter Carol, son-in-law David and grandchildren Rachel, Zach and Anthea. Lord, grant him eternal rest. CARUANA SCICLUNA – Dr JOSEPH CARUANA SCICLUNA. Treasured memories, today the sixth anniversary of his departing to eternal life. Always in our thoughts and prayers. Fondly remembered by his brothers and sisters, Noel and Rose, Anna and John, Adrian, Ina and Joe, Edna and Stephen, nephews and nieces. CUTAJAR. Everlasting and treasured memories of MIRIAM, a never forgotten mother, grandmother and sister, today being the 26th anniversary of her death. Sadly missed but never forgotten by Rowena, widow of her son George, her sons Kenneth and his wife Marie Claire, Anthony and his wife Sarah, Gordon and his wife Karen, her grandchildren, and sister, relatives and friends. Grant her, O Lord, eternal rest. FAVA. In loving memory of CHARLES, today the 19th anniversary of his passing away. Greatly missed by his wife Lina and his son David. Always in our hearts, thoughts and prayers. Lord, grant him eternal rest. GIORGIO. In loving memory of DUNSTAN today being the fourth anniversary of his demise. Always remembered and sadly missed. Lord, grant him eternal peace. STILON de PIRO – NADINE. In loving memory of a special mother and grandmother so greatly missed on the first anniversary of her demise. Forever in our hearts and prayers, her daughters Laura Gasan and Sandra Urpani, her grandchildren Christina, Nicholas and Lucas, her sister Karen Polotto and her father Dr Mario Stilon de Piro. Mass in her memory will be said tomorrow, Sunday, March 24, at 11am, at Lija parish church.